Who has it? Who doesn't? What is it? What does a constructive use of it look like, and alternatively a destructive use? What does it feel like when we perceive we don't have it? And what are some ways to re-assert our claim to it? These are some of the questions I've been reflecting upon recently, as I think about the face-the-depths Jupiter/Pluto Square that casts its hue in the archetypal landscape of this year. These questions also seem to be quite top-of-mind as I witness individual and collective fears and concerns stemming from the upcoming Presidential Inauguration. This particular period of time is striking to me as I’ve only recently become accustomed to thinking about my life in six-month packets, i.e., the period of time between my oncology checkups. I view these recurring appointments as a gift—an opportunity to reflect on where I am physically and emotionally, life lessons learned, and progress made in becoming my best self. But during the past few weeks, as I pondered the upcoming inauguration, I found myself increasingly full of dread [insert Jaws theme music here…]. I pulled myself together and thought, screw that, there’s no way that I’m waiting around paralyzed by what this new administration does/doesn’t do during its first 100 days—I’m not giving away that power or time out of my life. Instead, I’m challenging myself to use 100 days as a new unit of time to envision what I want to manifest for my own life, determine the resources I need, and set tangible steps to get there. In doing so, I can attack goals in even SMALLER packets of time since there are almost two "100 Days" in my new six-month window! In this way, I can compress time even more—not to diminish or constrict but to concentrate efforts that can explode into new creations and across dimensions. Plus, this goes a hell of a long way toward turning my dread into productive action. In closing, check out the lyrics to this song, performed by the late, great Sharon Jones & her band the Dap-Kings. 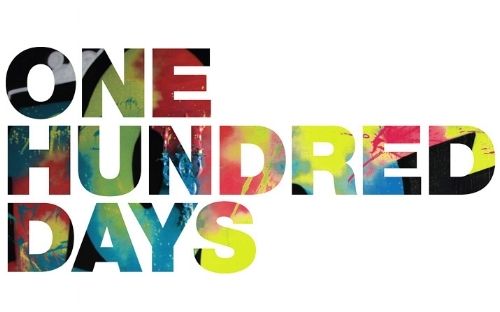 “100 days, 100 nights to know a man’s heart…” It’s right on the mark! p.s. If you think the “100 Days” idea could be of some benefit to your other clients, you have my permission to use this note in one of your upcoming messages on your website"
I can't tell you how much I love RAF's idea, of framing 100 Days as a way to catalyze change in our lives, to pull back a sense of power, and galvanize commitment through setting a goal in this time frame. I really thought that RAF's vision was beautiful and transformative, and loved how she also saw that it could be something that could help others. Do you want to create your own first 100 Days plan? It's something you can do at any time. And yet if it speaks to you, perhaps it's something you do in tandem with the timing of the President Elect's first 100 Days. If so, starting January 20, you would envision what you want to create in 100 days, by April 29. What goals do you want to achieve by then? What actions do you need to take to reach those goals? What would success look like? How would your achievements create a platform for inspiring a greater sense of creativity, joy, and empowerment? Consider these questions as you craft your own first 100 Days plan. 1/ If you want someone to witness what you are committing to, send me an email by January 20 with your plan for your first 100 Days, and I will hold the space for you, sending you back an email reflecting what you are taking on. 2/ Midway through your first 100 Days, I will send you a note to encourage you to stay the path and continue upon your dedication to your platform for powerfully reaching your goals. 3/ On April 29, I'll send you a note, marking the completion of your first 100 Days and checking in to see what you've achieved. The emails will help you to acknowledge and align with your commitment to your platform of personal empowerment and growth. If this idea speaks to you and you feel that you would get even more from it by working with me on a personal level, where we can navigate your first 100 Days in Stellar Guidance sessions, I'd love to work with you. Send me a note and we can discuss this further. Remember that your first 100 Days is not something that has to start January 20, nor is it something that you can only do once. If this idea resonates with you, use it as framework to design and reach goals at any time. I'm so grateful to all my clients, including RAF, who inspire and teach me, and enrich my life in such vast ways, notably as they then allow me to continue to be of service to others.